As the premier wedding photography and videography studio in Los Angeles, Lin & Jirsa is proud to provide its services throughout the greater LA metro area. We cover couples photography, wedding receptions, sneakout, as well as wedding preparation and the ceremony itself. Fortunately, Los Angeles is home to beautiful scenery and is also a short trip from other scenic areas in Southern California. Our world-class Los Angeles wedding photographers will make sure the magic of your wedding day is captured in our breathtaking wedding pictures. The city of Los Angeles is America’s second largest by population. More than four million people make their homes here today. The city has a long history that extends back many centuries. During the pre-colonial period, it was inhabited by two local tribes: the Tongva and the Chumash. It remained sparsely settled for many centuries. In 1771, Junipero Serra, a Franciscan friar, and explorer, built a mission in this part of the area as part of the Spanish exploration of the part of the United States. This mission would form the nexus of the city. For the next few decades, the population grew until was about six hundred and fifty settlers. Los Angeles was part of Mexico from about 1821 to 1847. After the Mexican-American war, it became part of California and ultimately part of America. By the turn of the century, about a hundred thousand people made their homes in the part of the US, drawn by the pleasing climate and the low cost of housing. In the 1920’s many movie companies choose this area as their headquarters and resulting in yet more population growth. World War II saw the development of the interstate highway system that made it easier for people to simply pack up and leave other parts of the country with great ease. While Los Angeles, in general, has a mild climate with only about thirty-five days of rain each year, it also has many micro-climates. Inland areas such as the San Fernando Valley may be as much as twenty degrees higher than areas by the water. The region has a mild climate compared to the rest of the country. The average high is about sixty-eight in January and about eighty-four in August. Snow and freezing temperatures are very rare. A common pattern is several years in a row with little rainfall followed by years with more precipitation. Los Angeles is a famously sprawling place. More than eighty separate neighborhoods and the district mark the landscape. 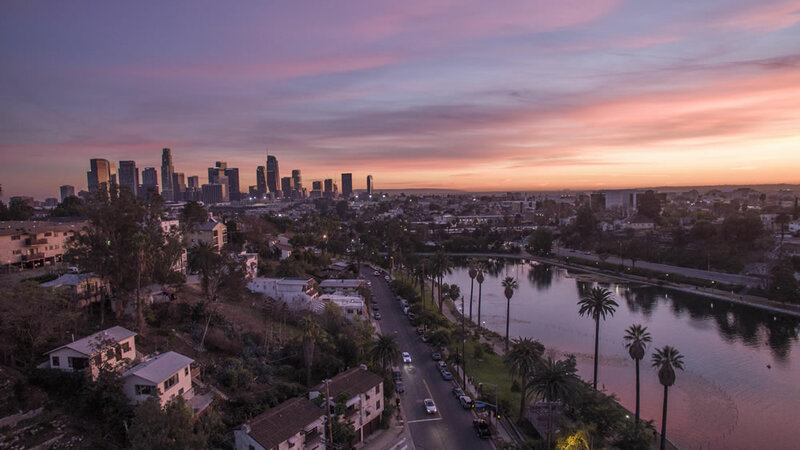 The city can be divided into about ten districts: East Los Angeles, South Los Angeles, Northeast Los Angeles, Downtown Los Angeles, Wilshire, the Westside, Greater Hollywood, the Harbor area and the Crescenta Valley and San Fernando Valley. Downtown Los Angeles is home to lots of tall buildings. The entire area is about five hundred square miles with about thirty-four miles being water and the rest land. The city includes Mount Lukens at over five thousand feet high. In the north lies the San Gabriel mountain range. The Los Angeles river stretches across fifty miles and serves to help with drainage. The city lies within the Pacific Rim of Fire. This makes it prone to earthquakes. While most earthquakes are too small to be felt, the area has been repeatedly subject to more dangerous quakes over the years. City residents are employed in many varied fields that take advantage of the city’s useful location and warmer than average climate. Health care and educational services represent the region’s major sources of employment. Other areas of significant employment include manufacturing, the retail trade, food service, technical services, and communication. The city is noteworthy as one of the world’s entertainment capitals. This is where many Americans films are created each year. International trade, particularly with the Pacific Rim and South America, is another factor driving the local economy. The aerospace industry has also seen a vast expansion in the area as it has the mild climate that makes it easier to service planes and outer space exploration. Many people also come here because they want to participate in the area’s many major attractions such as Disneyland. Services catering to the needs of both American and international travelers are a major part of the regional economy. Students also choose to come here to study at colleges and universities such as UCLA.